Now make your store better than others by just providing a bargaining service to your customers. Install the coolest Price Bargain Magento Extension in your eCommerce store and allow your customers to bargain on their purchases. The best feature of this extension is a customer as well as admin can bargain on the product price. This extension makes your website more productive and demanding from others. It is more helpful to those customers who are always waiting for the new offers and discounts. If you provide such services in your store customer can easily purchase anything and at any time. To use this service, customer must have an account on the site. After that customer will easily login to their respective accounts, they would be able to suggest or bargain on the new best price for each product. Don't forget customer always prefer the store, which provide the beneficial services to their customers. 1. Suppose, the customer interested to buy a T-Shirt from your store, where it's actual price is $100 and customer wants to purchase the same T-shirt at $90. In such situation, customer can use the bargaining service from your store by just clicking on the "Suggest Your Price" button on the "Product Listing" as well as on the "Product View Page"
2. Customer can bargain on that product by sending the new best price request to the admin that is lower than the actual price. 3. After receiving the request, the admin can accept, reject or suggest the new price to the customer and send the status notification to the customer (Approved/Rejected/Suggested New Price). 4. 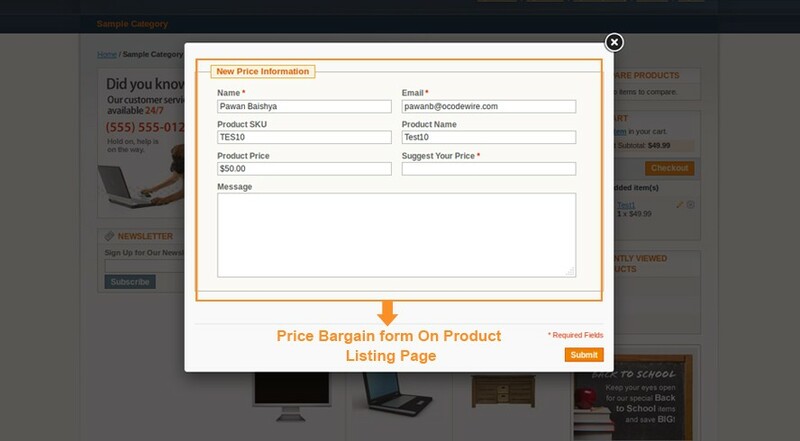 The customer can easily check their request status on the "User Dashboard" under "Ocodewire Price Bargain" tab. 5. If admin sends the last / final bargain price to the customer, then the customer can see that under the "Owner Price" on their dashboard. Customer can select an action according to their choices. 6. By clicking on "YES" Action, an "Approved Status" will be sent to the admin. As well, admin can approve that final price and send a coupon to the customer. 7. If a customer clicks on "NO" Action, then a "Rejected Status" will be sent to the admin. Step 1. Install the extension with Magento connect. Step 2. Delete / Refresh the Magento Cache from the Magento admin panel. Step 3. Extension will be enabled automatically. Check under System->Configuration->Advanced->Disable Modules Output to confirm it is enabled under name - Ocodewire_Pricebargain. Step 4. Now there should be one Main Menu named as "Price Bargain". 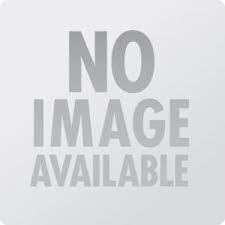 Just clicks on that, if it gives 404 page error, just logout from the admin panel and login again and click on this link. Step 5. After clicking on this link there should be a "Manage Bargain Price Dashboard" from here, you can see all the prices, customers listing and can send the response to the customer. Step 6. From the Price Bargain admin dashboard you can Approve, Disapprove or can send Final Price to the user. Easily manage offers, bargained products and transactions. Allow customers to add comments along with their offers. Send emails to accept, refuse, or offer new best price to customers automatically. Set and send Last Possible Price email automatically. Check the "Requested Bargain Price" for the product and the number of bargain requests. Check all the approved, pending request on single "Price Bargain Dashboard". Display Price Bargain Button on product listing page. Display Price bargain Button on product description page. Allows only registered users to bargain & get the more registered customers. Auto Approve/Reject the customer request. Set coupon expiry days limit. Easily bargain on the product price by just one click. Send the bargain price on any of the product. Bargain on multiple product prices. View and manage all the request on their personal account in "Customer Price Bargain Dashboard". Easily check their request status. Accept or reject the new product price by just clicking on "Yes" or "NO" button, if admin send the last / final price to the customer. Allow customer as well as admin to bargain on product price. Bargain on more than one products. Only admin has the right to accept/reject the bargain price. Support multiple languages and stores. Approved Request : By clicking on the Approve Request, an auto generated coupon sent to the customer dashboard. It allows the customers to use that coupon to purchase the negotiated products with the accepted new price. Reject Request : Admin may reject that request by just clicking on the Reject Request tab. Suggest Final Price : Admin can send last possible bargain price to the customer and customer can see that proposal on their dashboard. Admin can't cancel/reject an already approved request. Admin can not approve any request which is rejected by a customer. Admin can not implement multiple approved action for a single product. Q: Why there is an Error 404 after installation while browsing Ocodewire Designer configuration in admin? A: If you get an Error 404 after installation while clicking on Price Bargain Menu in admin, please flush the cache, log out from the admin and log in again. Problem has been solved and now you will be able to access the Price Bargain Extension with our 404 error. Q: How can admin know that someone sends the Price Quote? A: It is very simple just visit to the Price Bargain Extension Dashboard and you will get all the Price Quote from here only. Q: How can user send their suggested price to admin/store owner? A: User can send their Suggested price to the admin from the product listing page as well as from the product description page by clicking on the Suggested price button.
" have used many developers on Odesk before, some have been good and others have been poor. Browsewire team was excellent! I will definitely be using them again in the future. Thanks again for your hard work "
" They were pleasure to work with. Their quality of work was excellent and clearly a Magneto expert. In addition I found them a very pleasant and accommodating to work with. They will be my first choice for ecommerce projects in the future . " 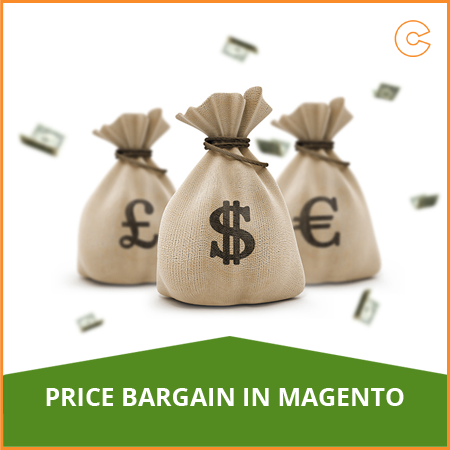 By Magento Price Bargain Extension buyers can easily bargain on the price of the particular products. The admin has full right to accept, reject and offer new price to the customer.